The perception of Jesus Christ in the Orthodox Church constitutes at the same time a thematic study of great significance for our salvation and a great challenge for all to seek truth and deeper meaning of life in the very person of Jesus Christ the God-Man. For us Orthodox Christians this study and challenge is not merely a matter of selecting certain facts and ideas from the Bible in order to invent "our own Christ," just as many Protestant groups have invented "their own Christs" it is rather a matter of testing our Biblical knowledge of Jesus Christ against the life of the Orthodox Church within the Tradition of Christ's Body, the Saints. For in the words of the great contemporary Serbian Orthodox theologian Archimandrite Justin Popovic, even if the Orthodox Church did not have the Bible as God's written word, the life of one Saint alone would suffice as the living and eternal evidence about Jesus Christ Himself. "The Saints", he said, "bear the character of the Divine Logos (Logosnost), and life in Christ our God (Bogozivot), thus witnessing to the living presence of Jesus Christ from generation to generation until the end of the world." (Prologue to the Lives of Saints, by Justin Popovic). In seeking the true perception of Jesus Christ in the Orthodox Church we are dealing not with an intellectual exercise, but with a matter of life and death - our salvation or our damnation. In order to simplify our approach to the subject, let us ask the very same question which Jesus Christ put to His disciples in the land of Caesarea of Philippi, a question that was asked twice, each time with greater emphasis. In the first instance, Christ asked the disciples, "Whom do people say that I the Son of Man, am?" (Mat 16:13) The disciples answer in the following manner, "Some say that you are John the Baptist, some Elias, some Jeremiah or one of the prophets." (Mat 16:14) From the words of the answer it clearly appears that those people who had seen Christ and who had witnessed His miracles, had perceived in Jesus Christ a unique person who displayed an unusual power and a potent force greater than any other human person could display. Yet they saw in Him merely the Son of Man, not the Son of God. Christ, however, desiring that the disciples, who were closer to Him than the other people, had repeatedly heard His teaching, had witnessed His life and miracles, and had tasted proofs of His divine origin, should have a true perception of Him both as the Son of Man in the mystery of the incarnation, as well as the Son of God in the full glory of His divinity, asked them the same question in a more personal and direct manner, "But whom do you say that I am?" - that is, St John Chrysostom adds, "you that are with me always, and see me working miracles, and have yourselves done many mighty works by me." (Homily 34, on Matthew 16:15). Then Simon Peter, acting as the leader and spokesman of the Apostles, boldly and openly declared, "You are the Christ, the Son of the living God." (Mat 16:1,6). This is indeed a great confession, the bold confession of the Truth concerning Jesus Christ, especially declaring His Godhead and His divine Economy in the mystery of His incarnation. While looking at the humanity of Jesus Christ and accepting Him as the Son of Man, Simon Peter also perceives in Him simultaneously His divinity and confesses Him to be the Son of the living God. Furthermore, he expresses his perception of Christ with a steadfast and unwavering conviction, "You are the Christ, the Son of the living God', thus correctly confessing Christ as the Only-Begotten One from the Father". (cf. Creed, "true God from true God..."). The great significance of Peter's confession is further emphasised by Jesus Christ in the next verse, "You are Peter, and upon this rock (namely, on the faith of your confession) I will build my Church. " (Mat 16:18). In other words the perception of Jesus Christ as the Son of the living God constitutes the very foundation of the Church of Christ. Such perception allows no reservations and no doubts concerning either the divinity or the humanity of Jesus Christ. We shall return to this point again, but for the time being let us enrich our perception of Christ beginning with the experience of the New Testament witnesses of the Resurrection of Christ and the Advent of the Holy Spirit. Jesus is our Saviour (Mat 1:21), and Christ means the "Anointed one" by God's spirit. Christ is perceived as the Second Person of the Holy Trinity and is the true image and likeness of God the Father. (Col 1: 15) Jesus Christ has revealed to us the true nature of God (John 1:18), as well as the true character of the human person, since he became the perfect man (John 1: 14). He is of one essence with the Father, and is both accessible to the world, but also transcendent above the heavens. (Heb 7:25). Such is, very briefly, a picture of the perception of Jesus Christ from the Scriptures - we have entirely omitted the Old Testament types "of Him who has to come" (Rom 5:14), whilst we have only lightly touched on some of the New Testament references. Who do we say that Jesus Christ is? Who is this Jesus Christ in whom we believe as baptised members of the Orthodox Church? At any rate, how are we to understand Simon Peter's answer that Jesus Christ is "the Son of the living God?" (Mat 16:16). Such questions were undoubtedly in the minds of the Apostles, and they are also in our minds, as we endeavour to fathom the mystery of the incarnation, and as we struggle to grow in our faith in the Lord Jesus Christ as God and Saviour. Our endeavour and struggle becomes all the more imperative since we are confronted with hundreds of churches and sects in our neighbourhood. Among them there are some who believe and teach that Jesus Christ is only man, a great social reformer, at the most a great prophet, teacher or archangel (Arianism). Others emphasise the divine at the expense of the human nature of Christ (Monophysitism). Any excessive emphasis on either Christ's divinity or His humanity does not simply create confusion on the theoretical level of faith; it also has immense repercussions and consequences on the practical level, since truth and doctrine have their corresponding application in life itself. Accordingly, if Jesus Christ is less than God, He cannot bring salvation to man. For "neither a messenger, nor a man, but the Lord Himself saved us." (Isaiah 63:9). Again, if Jesus Christ is only God and not man, then He is transcendent but not personally accessible to man. For "What is not assumed, cannot be healed", St Gregory the Theologian says emphatically. The Orthodox perception of Jesus Christ preserves a balance between such extremes. Firstly, as declared by the third Ecumenical Council of Ephesus in 331 AD the unity of one Person of Jesus Christ the Son of God is safe-guarded by the adoption of the title Theotokos for the Virgin Mary, "Who gave birth to the Logos of God made flesh." (Cyril of Alexandria) Secondly, as decided by the Fourth Ecumenical Council of Chalcedon in 451 AD, Jesus Christ is one Person in two natures and in one hypostasis. The Fathers stated their belief in "one and the same Son, perfect in Godhead and perfect in manhood, truly God and truly man ... acknowledged in two natures unconfusedly, unchangeably, indivisibly, inseparably: the difference between the natures is in no way removed because of the union, but rather the peculiar property of each nature is preserved, and both combine in one person and in one hypostasis." (Definition of Chalcedon, in T. Ware, The Orthodox Church). The hymnography of the Orthodox Church palpably brings out the contrast of the two natures of Jesus Christ, a contrast which becomes a stumbling block for non-believers, but which naturally constitutes the centre and the basis of our Orthodox Christian faith about Jesus Christ Take, for instance, the Kontakion of the Feast of the Nativity of Jesus Christ, the Feast of the mystery of the Incarnation of Christ. This hymn by St Romanos the Melodist ends with the words, "A new-born Child, God before the ages." Here we confess our steadfast faith in the One Person of Jesus Christ in His two natures. The Orthodox Church has never lost sight of the real personality of Jesus Christ. He is in truth the Messiah, the central figure and the fulfillment of the entire creation. He marks a radical demarcation line between things "old" and "new", and divides history into BC and AD. He is at the same time the "Jesus of History" and the "Jesus of our faith", having become one of us without losing His divinity, but also transforming history from its fallen state. The Orthodox Church offers us the proper guarantee for our correct perception of the Person of Jesus Christ. The Church as the Body of Christ incorporates us in the "temple not made by hands" and by the Holy Spirit leads to the Truth, that is to Jesus Christ. With the 'great cloud of witnesses' the Church directs us to "look unto Jesus the author and finisher of our faith". (Heb 12:1-2). Jesus Christ said, "I am the way, the truth, and the life: no one comes unto the Father but by me". (John 14:6). In Jesus Christ we can hope for eternity, salvation and the transfiguration of all creation. Brothers and Sisters, far from claiming to have exhausted the subject which I was asked to develop in this paper, I wish to conclude by repeating the words of St John the Theologian with which he finishes his Gospel, "And there are also many other things which Jesus did, which, if they should be written in detail, I suppose that even the world itself could not contain the books that should be written". (John 28:25). In earliest Christian times, until the Church's faith in the Oneness of Essence and the equality of the Persons of the Holy Trinity had been precisely formulated in strictly defined terminology, it happened that even those church writers who were careful to be in agreement with the universal consciousness of the Church and had no intention to violate it with any personal views of their own, sometimes, together with clear Orthodox thoughts, used expressions concerning the Divinity of the Persons of the Holy Trinity which were not entirely precise and did not clearly affirm the equality of the Persons. This can be explained, for the most part, by the fact that in the same term some shepherds of the Church placed one meaning and others, another meaning. The concept "essence" was expressed in the Greek language by the word ousia, and this word was in general understood by everyone in the same way. Using the word ousia, the Holy Fathers referred it to the concept of "Person." However, a lack of clarity was introduced by the use of a third word, "Hypostasis." Some signified by this term the "Persons" of the Holy Trinity, and others the "Essence." This circumstance hindered mutual understanding. Finally, following the authoritative example of St. Basil the Great, it became accepted to understand by the word Hypostasis the Personal attributes in the Triune Divinity. In the Apostolic Age — the Ebionites (after the name of the heretic Ebion). The Holy Fathers testify that the holy Evangelist John the Theologian wrote his Gospel against them. In the third century, Paul of Samosata was accused by two councils of Antioch in the same century. The most dangerous of all the heretics was Arius, the presbyter of Alexandria, in the 4th century. Arius taught that the Word, or Son of God, received the beginning of His existence in time, although before anything else; that He was created by God, although subsequently God created everything through Him; that he is called the Son of God only because He is the most perfect of all the created spirits, and has a nature which, being different from the Father's, is not Divine. This heretical teaching of Arius disturbed the whole Christian world, since it drew after it very many people. In 325 the First Ecumenical Council was called against this teaching, and at this Council 318 of the chief hierarchs of the Church unanimously expressed the ancient teaching of Orthodoxy and condemned the false teaching of Arius. The Council triumphantly pronounced anathema against those who say that there was a time when the Son of God did not exist, against those who affirm that he was created, or that He is of a different essence from God the Father. The Council composed a Symbol of Faith, which was confirmed and completed later at the Second Ecumenical Council. The unity and equality of honor of the Son of God with God the Father was expressed by this Council in the Symbol of Faith by these words: "of One Essence with the Father." After the Council, the Arian heresy was divided into three branches and continued to exist for some decades. It was subjected to further refutation in its details at several local councils and in the works of the great Fathers of the Church of the 4th century and part of the 5th century (Sts. Athanasius the Great, Basil the Great, Gregory the Theologian, John Chrysostom, Gregory of Nyssa, Epiphanius, Ambrose of Milan, Cyril of Alexandria, and others). However, the spirit of this heresy even later found a place for itself in various false teachings both of the Middle Ages and of modern times (the sect of Jehovah’s Witnesses has resurrected the defeated Arian heresy from the dust of history). In answering the opinions of the Arians, the Fathers of the Church did not overlook a single one of the passages in Holy Scripture which had been cited by the heretics in justification of their idea of the inequality of the Son with the Father. Concerning the expressions in Sacred Scripture which seem to speak of the inequality of the Son with the Father, one should bear in mind the following: a) that the Lord Jesus Christ is not only God, but also became Man, and such expressions can be referred to His humanity; b) that in addition, He, as our Redeemer, during the days of His earthly life was in a condition of voluntary belittlement, "He humbled Himself, and became obedient unto death" (Phil. 2:7-8). In keeping with these words of the Apostle, the Fathers of the Church express this condition by the words ekkenosis, kenosis, which mean a pouring out, a lessening, a belittlement. "Foreseeing Thy divine self-emptying upon the cross, Habakkuk cried out marveling" (Canon for the Matins of Great Saturday). Even when the Lord speaks of His own Divinity, He, being sent by the Father and having come to fulfill upon the earth the will of the Father, places Himself in obedience to the Father, being One in Essence and equal in honor with Him as the Son, giving us an example of obedience. This relationship of submission refers not to the Essence (ousia) of the Divinity, but to the activity of the Persons in the world: the Father is He Who sends; the Son is He Who is sent. This is the obedience of love. Such is the precise significance, for example, of the words of the Savior in the Gospel of John: "My Father is greater than I" (John 14:28). One should note that these words are spoken to His disciples in His farewell conversation after the words which express the idea of the fullness of His divinity and the Unity of the Son with the Father: "If a man love me, he will keep my words and My Father will love him, and We will come unto him and make Our abode with him" (v. 23). In these words the Savior joins the Father and Himself in the single word "We," and speaks equally in the name of His Father and in His own name; but, since He has been sent by the Father into the world (v. 24), He places Himself in a relationship of submission to the Father (v. 28). A detailed examination of similar passages in Sacred Scripture (for example, Mark 13:32; Matt. 26:39; Matt. 27:46; John 20:17) is to be found in St. Athanasius the Great (in his sermons against the Arians), in St. Basil the Great (in his fourth book against Eunomius), in St. Gregory the Theologian, and in others who wrote against the Arians. However, if there are such unclear expressions in the Sacred Scripture about Jesus Christ, there are many, one might even say innumerable, passages that testify of the Divinity of the Lord Jesus Christ. First, the Gospel as a whole testifies of Him. Concerning separate passages, we will indicate here only a few of the more important ones. Some of these passages say that the Son of God is true God; others state that He is equal to the Father: still others say that He is One in Essence with the Father. 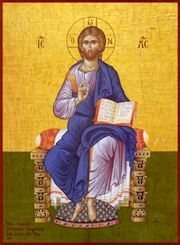 It is essential to keep in mind that to call the Lord Jesus Christ God — theos — in itself speaks of the fullness of Divinity in Him. Speaking of the Son, the Apostle Paul says that "in Him dwelleth all the fullness of the Godhead bodily" (Col. 2:9). "In the beginning was the Word and the Word was with God, and the Word was God. The same was in the beginning with God. All things were made by Him; and without Him was not made anything that was made" (John 1:1-3). "Great is the mystery of godliness: God was manifest in the flesh" (1 Tim. 3:16). "And we know that the Son of God is come and hath given us an understanding that we may know Him that is true; and we are in Him that is true, even in His Son Jesus Christ. This is the true God, and eternal life" (1 John 5:20). ". . . Of whom as concerning the flesh Christ came, Who is over all, God blessed forever. Amen" (Rom. 9:5). "My Lord and my God" — the exclamation of the Apostle Thomas (John 20:28). "Take heed therefore unto yourselves and to the whole flock, over the which the Holy Spirit hath made you bishops, to feed the Church of God, which He hath purchased with His own blood" (Acts 20:28). "We should live soberly, righteously, and godly in this present world, looking for that blessed hope and the glorious appearing of the great God and our Savior Jesus Christ" (Titus 2:12-13). That the title of "great God" belongs here to Jesus Christ is made clear for us from the sentence construction in the Greek language (a common article for the words "God and Savior"), as well as from the context of this chapter. "And the Word was made flesh, and dwelt among us, and we beheld His glory, the glory as of the only-begotten of the Father" (John 1:14, 18). "For God so loved the world, that He gave His only-begotten Son, that whosoever believeth in Him should not perish, but have everlasting life" (John 3:16). "For what things soever he doeth, these also doeth the Son likewise" (John 5:19). "For as the Father hath life in Himself, so hath He given to the Son to have life in Himself" (John 5:26). "That all men should honor the Son, even as they honor the Father" (John 5:23). "I and My Father are one" (John 10:30) — in Greek, en esmen, one in essence. "I am in the Father, and the Father in Me" (John 14:11; 10:38). "All Mine are Thine, and Thine are Mine" (John 17:10). "I am Alpha and Omega, the beginning and the ending, saith the Lord, which is, and which was, and which is to come" (Rev. 1:8). "And now, O Father, glorify Thou Me with Thine own self with the glory which I had with Thee before the world was" (John 17:5). "All things were made by Him; and without Him was not anything made that was made" (John 1:3). "For by Him were all things created that are in heaven and that are on earth, visible and invisible, whether they be Thrones, or Dominions, or Principalities, or Powers: all things were created by Him, and for Him: and He is before all things, and by Him all things consist" (Col. 1:16-17). The word of God speaks similarly of the other Divine attributes of the Lord Jesus Christ. The problem of 'being' and 'non being', known from the History of Philosophy, is the most basic question of Plato. Approximately the same problem was expressed dramatically by Shakespeare with the familiar phrase "To be or not to be". The exclamation of the French surrealist A. Rimbaud "I am someone else" bears witness to an incandescent 'ecstasy' of an unprecedented 'alchemy'. And G. Xenopoulos satirised the problem with the theatrical work "I am not me". Parallel to these indicative testimonies in classical literature - both the older and the new - there is also the archetypal figure of Ulysses who, when asked about his identity, responded completely apophatically by saying he was "no one". If we analyse each of the above cases, we shall see that, together, they present us with a wondrous gamut of the natural person's philosophical, psychological and even sociological questioning. In Plato, the problem is presented with almost metaphysical agony, a matter of life or death. Yet because this agony is not indifferent to our moral behaviour, but rather influences it directly, we are not entitled to call this simply a philosophical problem. In Shakespeare, the question expresses an intense moral and social vigilance in the form of a dilemma within the framework of aesthetic play writing. In A. Rimbaud we have, more than existential agony, a totally new form of aesthetic compunction or poetic magic, the power of which "dismantles all the senses". This is the "new bearing", which is said to have been introduced to poetry by Rimbaud. In Xenopoulos, the problem does not go beyond the witty tragicality of social farce. As for the Homeric "no one", it is clear that we have here a device of the cunning Ulysses, to rid himself from the outset of every notion of responsibility for his actions. In the field of Biblical Revelation, namely the Old and New Testament, the same question of 'being' and 'non being' is by no means unknown. However, the meaning given to this differs from the already mentioned secular instances, as much as the sun differs from the earth. The concept of 'chance' has no place in Biblical cosmology and anthropology, and 'vanity' therefore has no place either (the book of Ecclesiastes is a special case, but this is not the time to comment upon it). Since everything was created by God "out of nothing", and indeed 'very good', then it is self-evident that even the last mustard seed has its place and value - which is non-negotiable - in the whole plan of the divine economy. And if this is true for inanimate objects, how much more so for intellectual and spiritual beings, ie. angels and human beings. God created both categories of personal beings (angels and human beings) in order to "collaborate" in the salvation of the world. That is why angels are on the one hand defined in theology as "liturgical spirits sent for service". The human, on the other hand, by developing "according to the measure of the gift of Christ" (Ephes. 4:7) is shown forth as "a chosen vessel" (Acts 9:15) and "stewards of the mysteries of God" (1 Cor. 4:1). The notion precisely of "person", revealed by the Trinitarian God Himself as the most characteristic 'mode of existence' of divine life, is almost identical to the notion of kenosis, or 'self-emptying'. Even the inner Trinitarian life, which is infinite love and communion - called "interpenetration" by the Fathers - between the three divine Persons, is expressed only as 'kenosis'. However, this self-emptying does not mean reduction or bankruptcy. Precisely the opposite, kenosis is the abundance of love and power and life. The most characteristic and sublime archetype for us is the Son and Word of God, about whom the Apostle Paul writes the following unprecedented words, which at first glance appear to be scandalous, being 'incompatible' with the conception of divinity at that time. St. Paul said, "Though He was in the form of God, He did not regard equality with God as something to be exploited, but emptied Himself, taking the form of a slave, being born in human likeness. And being found in human form, He humbled Himself and became obedient to the point of death - even death on the Cross. Therefore God also highly exalted Him and gave Him the name that is above every name" (Phil. 2:6-9). From this supremely unique example of Christ Himself, the true measure of being in God is derived. If the "will of the Father" is the highest 'due', ie. the determinant power for life and death, then even the Son, who is "of one essence with the Father", justly has no greater possibility of expressing the divine essence than to continually fulfil "the will of the Father". For this reason He said unreservedly: "My food is to do the will of Him who sent me and to complete His work" (John 4:34). Just as in the initial establishment of all things, at the point of Creation, everything is made and co-exists from the moment that the founding word of God is pronounced - as an expression of the divine will ("God said, and it was so") - so it is subsequently, in the whole course of the divine economy, that being in Christ necessarily presupposes the fulfilment of the divine will. If the entire Creation came "out of nothing" through the divine will alone, then it is only natural that this is maintained in existence again only through the will of the Father. This is not only expressed by the Son, but also fulfilled in the Holy Spirit, through all works of the seven-day Creation. This is precisely why the early Fathers of the Church called the Son and Word of God the "arm" of the Father. The Apostle Paul originally saw the direct causal relationship between the divine will and existence in Christ as a general form of good will of God towards the whole creation. This is why he emphasises what a great benefaction it was for God to call "into existence the things that do not exist" (Rom. 4:17). St. Paul however narrows that general benefaction to human beings in particular, and indeed to his own self. The more his earthly journey draws to a close, the more he feels that to be 'spent' does not mean that he is 'reduced', but rather that he 'increases' in Christ. He recognizes that, just as the outer man 'decays', the inner man is 'built up'. And when he has 'emptied' himself completely, he will exclaim almost doxologically: "It is no longer I who live, but Christ who lives in me" (Gal. 2:20). All the Saints of the Church saw the struggle of completion in this way, from the solitary Hermits and Stylites, to the most tortured martyrs. For it does not matter whether you 'empty' the futility of the fallen world silently, drop by drop from your personal life, or whether you become a burnt offering through a martyr's death. In fact, the first is probably more difficult, as it demands a new decision for obedience and sacrifice at each moment of your earthly life. Perhaps Malaparte was not wrong when he said, "it is easier to sacrifice your life than your self!" At any rate, the example of St. John the Forerunner is similar to that of the Apostle Paul, who was made worthy of seeing his corruptible life 'assimilated' completely by Christ. We read concerning him in the Acts of the Apostles, "As John was finishing his work, he said, 'What do you suppose that I am? I am not he. No, but one is coming after me; I am not worthy to untie the thong of the sandals on his feet' "(Acts 13:25). We should note especially the phrase "as he was finishing...", which means that he makes the correlation of his life with Christ - as St. Paul does - not at the beginning, nor upon the further development of his work, but at the end, namely the greatest climax of his life. It is at this vital point that worldly existence can be radically differentiated from existence in Christ. The secular person considers the 'fulfilment' of work, that is to say the completion of the journey, to be the most appropriate and convenient time to claim praise and self-attestation. The one who struggles in Christ, upon reaching the highest conquest, sees himself precisely then as being 'empty' of himself, and hastens to confess the words "not I". For this reason, the Saints never spoke of their own "feats" or "achievements", but only of their "sufferings", and in fact considered themselves privileged if they were eventually able to be characterised as those who "suffered the divine".